It's closing time at the brewery. While the moon rises, the brewery crew--including three little otters (in charge of the water), a wort hog, and a hops wildebeest--introduce us to the brewing equipment, ingredients, and styles of beer. Join this fanciful crew as they close down for the evening and say goodnight to the brew kettle, barley and yeast, hops and mash, saison, porter, IPA, and much more. Befuddled about beer ingredients? Puzzled about the brew process? Can't remember the difference between an ale and a lager? Don't miss the brew infographics that follow the story! This humorous parody of a children's literature classic is a "pitcher book" for grown-ups. 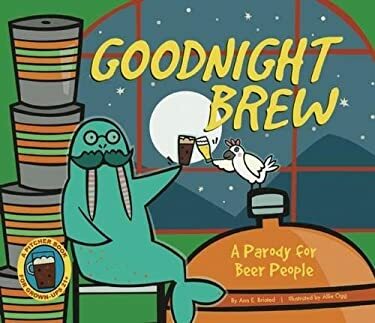 It's a besotted bedtime story for beer lovers everywhere! New (181 available) BRAND NEW. Over 1.5 million happy customers. 100% money-back guarantee. Make your purchase count: support Better World Books' worldwide literacy partners.